Featuring over 1,500 engravings that originally graced the pages of Webster's dictionaries in the 19th century, this chunky volume is an irresistible treasure trove for art lovers, designers, and anyone with an interest in visual history. Meticulously cleaned and restored by fine-press bookmaker Johnny Carrera, the engravings in Pictorial Webster's have been compiled into an alluring and unusual visual reference guide for the modern day. Images range from the entirely mysterious to the classically iconic. From Acorns to Zebras, Bell Jars to Velocipedes, these alphabetically arranged archetypes and curiosities create enigmatic juxtapositions and illustrate the items deemed important to the Victorian mind. 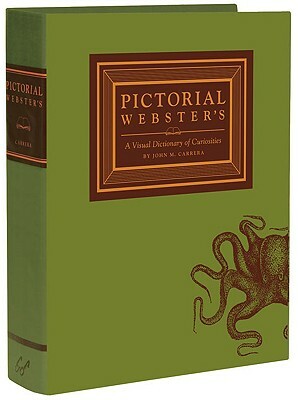 Sure to inspire and delight, Pictorial Webster's is at once a fascinatinghistorical record and a stunning jewel of a book. John M. Carrera is a printer, bookbinder, and artist who has taught and lectured extensively. He is the founder and proprietor of Quercus Press letterpress and bindery. He lives in Waltham, Massachusetts.